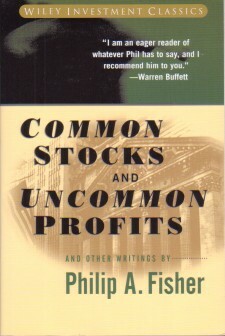 Philip Fisher was an American investor best known as the pioneer of growth investing and the author of Common Stocks and Uncommon Profits, a guide to growth investing that has remained in print ever since it was first published in 1958. 1. There is a complicating factor that makes the handling of investment mistakes more difficult. This is the ego in each of us. None of us likes to admit to himself that he has been wrong. If we have made a mistake in buying a stock but can sell the stock at a small profit, we have somehow lost any sense of having been foolish. 2. On the other hand, if we sell at a small loss we are quite unhappy about the whole matter. This reaction, while completely natural and normal, is probably one of the most dangerous in which we can indulge ourselves in the entire investment process. 4. Investment is rarely an optimized process in hindsight. Most of the time, you can attempt to position yourself for a sub-optimal return, which ain’t too bad at all. 5. I don’t want a lot of good investments; I want a few outstanding ones. If the job has been correctly done when a common stock is purchased, the time to sell it is almost never. 6. I remember my sense of shock some half-dozen years ago when I read a [stock] recommendation to sell shares of a company . . . The recommendation was not based on any long-term fundamentals. Rather, it was that over the next six months the funds could be employed more profitably elsewhere. 7. The stock market is filled with individuals who know the price of everything, but the value of nothing.